Do you have trouble growing a beard? If so, you’re not alone. In fact, many men experience some sort of difficulty when they first learn how to grow a beard, whether it's a patchy beard or a mustache that won’t ever seem to connect to its beard. Luckily, there are beard growth products that can help you in your quest to grow a beard. When your beard first starts growing in and breaking through the skin, it's normal for it to feel extremely itchy. To keep the itchiness at bay while new facial hairs grow in, use Beard and Company’s gentle cooling beard shampoo. The addition of tea tree oil not only makes your face feel cool and tingly but it also exfoliates your skin of dirt and oil build-up. After shampooing your beard and following up with a hydrating beard conditioner, apply Extra Strength Beard Growth Oil, an all-natural beard oil that’s formulated to promote beard growth while adding moisture back into your beard. Beard balm is an excellent tool for filling in patchy areas that grow slower than the rest of your beard, such as patchy cheeks. 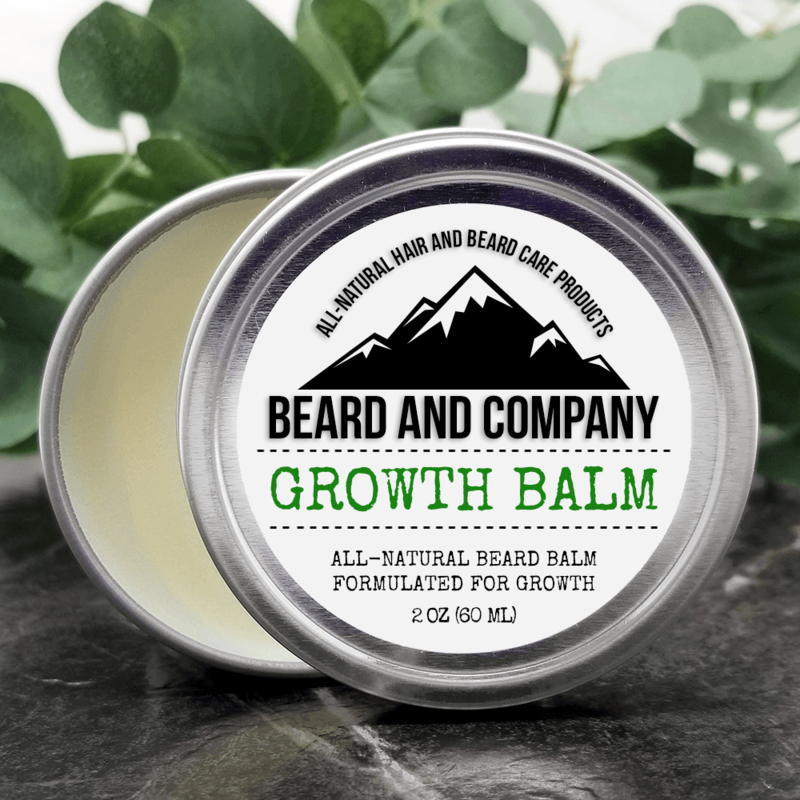 Beard Growth Balm not only makes your facial hairs look thicker and fuller, but it contains all-natural ingredients formulated to grow beards faster. It tackles the problem of facial hair dryness by nourishing your beard with omega-3 fatty acids and vital nutrients like magnesium, vitamin C, iron, potassium, folate, vitamin E, zinc, and the vitamin B complex. Adds a lot of moisture back into your beard. Treats a host of problems related to dryness such as dandruff, split ends, and soreness. Promotes blood circulation and stimulates hair follicles. Contains linoleic, oleic, palmitic and stearic acids which promote hair growth even faster alongside our natural growth formula. Fights off fungal infections which are not good for growing hair. Tamanu oil seals in moisture in your hair which keeps it from drying out over time. Using beard growth oil is a great way to hydrate dry facial hair and keep your beard soft while also encouraging it to grow. If you are suffering from a painful & itchy scalp, patchy areas or want to try to connect your mustache to your beard, this is the oil for you. It's also one of the best beard growth products for African American men and those of us with coarse, dry beards. Having lived in the South and experienced the insanely hot and humid summer months, we know just how hard it can be to maintain an awesome looking beard in the heat. And sometimes the last thing you want to do is put oil in your beard when you’re already hot and sweaty. 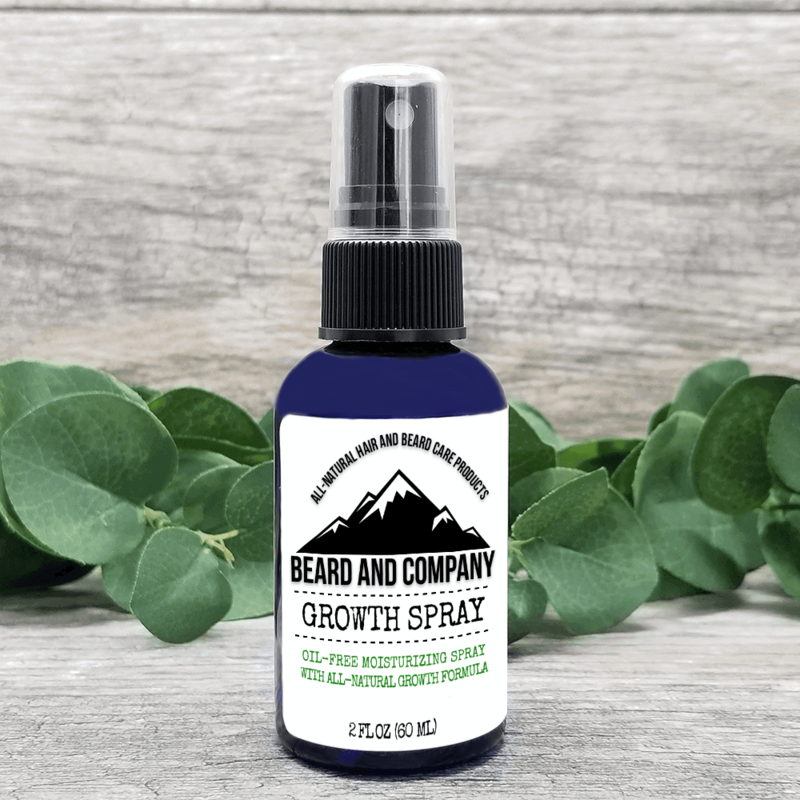 Our beard growth spray contains the same growth power as our other growth products while maintaining a carrier oil-free formula. We took our beard growth formula, gave it a natural, oil-free base with aloe vera and a cooling shot of pure peppermint oil and tea tree oil for a tingly, cooling sensation. This will be your favorite warm-weather beard product. Moisturizes your beard without adding oil. Cools and tingles with the help of all-natural peppermint and tea tree oils. Promotes growth by adding vitamins and nutrients to your beard. Hydrating and healing aloe vera helps to cool and hydrate your skin keeping it from drying out. Beard Growth Spray is an excellent solution for those with oily skin who want to increase beard growth. It’s also great as a way to cool and freshen your beard in hot weather or just for those days when you don’t feel like using beard oil but you don’t want to have a dry beard, which no one does. A common problem many men experience when they’re growing a beard is areas of patchiness. You might find that the hair around your cheeks doesn’t fill in as quickly as the hair around your jaw. It can be a pretty annoying problem to deal with but the good news is that there’s a fix for your patchy beard: Beard and Company's beard growth balm. When trimming your beard, trim around the patchy areas, careful not to hit those areas. Instead, trim the longer parts that seem to grow faster than the rest of your beard so they have a chance to catch up properly. Beard balm is a great product to use for styling your beard. It adds a lot of texture in your beard and give it the appearance of being fuller due to our high quality shea butter. It has been used for years to make hair appear fuller and thicker while helping it get there naturally. It coats the hair doing a couple things at the same time. It also protects the hair from dirt and debris in the air and also moisturizes your hair and skin. We added our all-natural growth formula to our beard balm so now you can boost your growth while holding your whiskers in place all day. Makes your beard appear thicker and fuller without adding a lot of weight. Smooths your whiskers into place as pomade works for hair. Promotes beard growth with our growth formula. Won’t melt like other coconut oil based balms. Beard balm is a great way to add some texture and fullness to your beard while also keeping it styled. It’s perfect for nearly anyone with a beard to use, provided your beard isn’t in the earliest days of its growth. You don’t want to massage this into your skin due to the beeswax content which provides hold. The wax really helps coat and protect your beard but it can clog pores if you use too much. Luckily it isn’t a problem as long as your beard is at least a few months in. Most beards are not complete without a mustache. Some beards just look weird and not right without a mustache, too. Think about it. Without a mustache, you can’t even grow a mustache! Having whisker troubles? Check out our mustache growth roll-on. 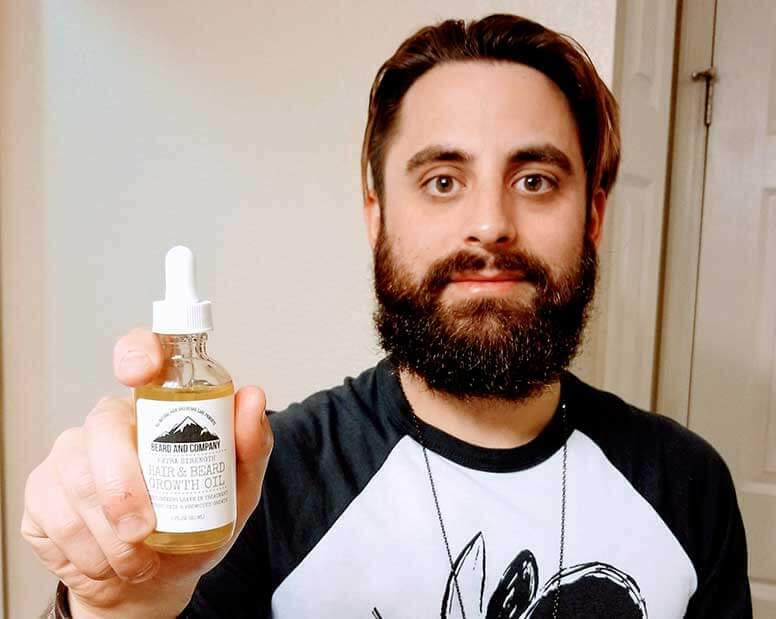 We took our all natural growth formula and combined it with our MCT oil (medium chain triglycerides) helps to transport everything you need to your mustache hair and upper lip. MCT oil is a perfect carrier oil because it is high in omega fatty acids. The actual medium chains of MCT oil are easily digestible by the body which in turn makes it great for energy when it gets broken down. Great fuel for your cells. Powerful MCT oils provides long-lasting cell energy to hair and skin. MCT oil tends to feel less oily than others. When you need to get your mustache growing as full and thick as possible, and trust us because you do, this is what you should be using. 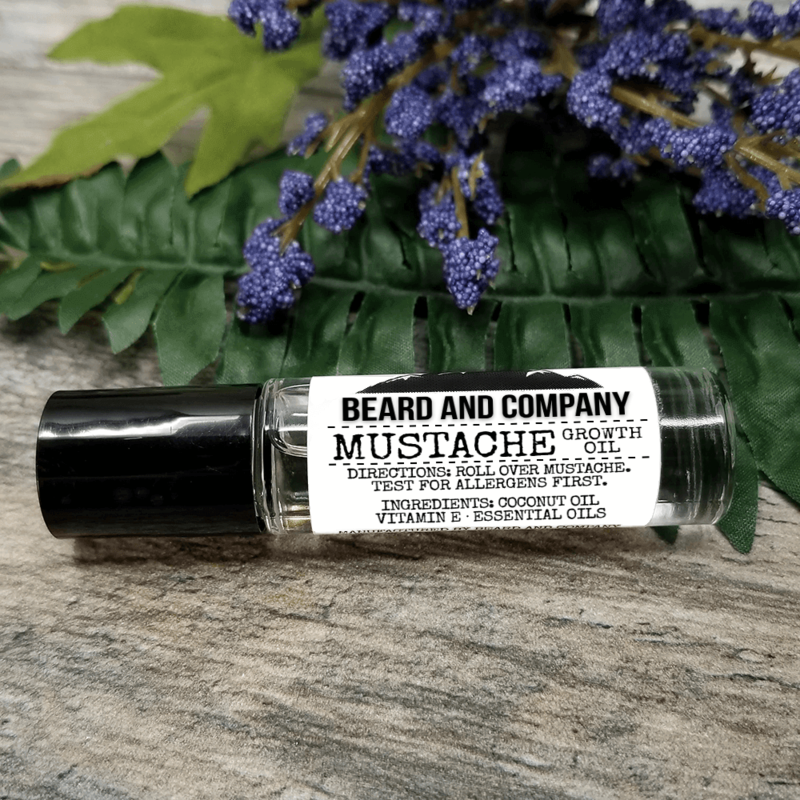 We formulated our growth oil into a mustache roll-on specifically for the mustache. Our MCT oil base carries nutrients quicker than other carrier oils while providing your mustache area with long-lasting cell energy. This surplus of energy will help the growth formula penetrate and start working faster and longer. We took the best carrier oils to promote beard growth and put them in one bottle combined with our all natural growth oil. We use jojoba oil, almond oil, argan oil,jojoba oil, vitamin E oil and our essential oil blends to stop that beard itch, painful skin underneath your beard, ingrown hairs, beard damage, dry skin, flaky skin and even help your beard grow even better. This combination of oils gives your hair and skin a high protein and omega filled oil rich with nutrients and vitamins vital for beard growth. Helps to stimulate hair follicles, promotes blood circulation in the skin while hydrating your skin and protecting your hair. There are beard oils and then there are our formula oils. These do more than just hydrate your beard and skin. This is our classic formula that started it all. Why use regular beard oil with synthetic fragrances that can dry out hair and skin when you can use a formula that is made to grow beard hair even longer? We took the holding power and moisturizing ability of our beard balm and combined it with the protecting and growth-helping power of tamanu oil in our extra strength growth oil. Tamanu oil is very thick on its own but when you use it in conjunction with a holder like beeswax and natural shea butter, it injects a glorious shine. Its amazing moisturizing ability keeps your beard healthy and shiny while keeping all those stray hairs down and out of the way. If you are in need of the perfect beard balm, this is it. Our extra strength growth balm has everything you need to keep that medium to long beard healthy and growing even longer. Sometimes things happen and you need to re-grow your beard longer than you want it. Sometimes you never had the ability and you are doing everything you can while some others might need some protection to help it grow longer. Jobs that have a lot of debris and dust flying around can dry out your hair and skin, damaging it in the process which makes it harder and sometimes possible to grow back out. A good balm will catch the debris allowing you to wash it away before it causes damage. Keeps debris and dust out away from your skin and hair. Added tamanu oil keeps nasty things like fungal infections and irritated skin away so hair can grow faster and healthier. Gives your beard incredible shine. Want the best of both worlds? This is it. This will give your beard everything it needs (our growth formula) to get that hair and skin healthy and glowing. It also gives what your beard didn’t know it needed...tamanu oil. The added benefit of holding power will catch bad stuff like debris and dust, especially if you work in an environment where this is present all the time like construction work. No matter what you choose, your facial hair will thank you. Beard and Company products are made with premium organic ingredients that are the best in their class. Formulated products like our growth oils are made with proven ingredients to help hair growth naturally. Why Did My Beard Stop Growing? How Fast Does Facial Hair Grow? Does Shampooing Your Beard Make it Grow? Why Does Growing A Beard Hurt? How Can I Encourage Patchy Areas of My Beard to Grow? Does Shaving Make Your Beard Grow Longer? Does Minoxidil Stimulate Facial Hair Growth? Do Beard Growth Vitamins Actually Work? When we imagine what a man with a great-looking beard looks like, we usually imagine a guy with a neatly groomed, full-looking beard. That is the goal. Why is my beard itchy and flaky? How to get your beard to connect? How can you relax your beard? I have beard split ends. How can I make my beard softer? How to grow a beard if you can't? The truth is, it can take a lot of time, patience, grooming, trimming, beard care products, and plain old trial and error to grow a really nice looking beard worthy of envy. After much research, we found the best blends of all-natural essential oils for growing, repairing, and strengthening dry, damaged beards. Our beard growing products typically take anywhere from 30-90 days for their full power to take effect but there has been positive results before the 30 days. Beards grow faster than the hair on your head but once the hair reaches around half an inch, new growth often slows. So if you're like me and need a little help encouraging your beard hair to grow, check out our list of the best products to grow your beard. Unlike regular scented beard oil, formulated beard oils are specially formulated with pure botanical oils that nourish your beard with essential vitamins and nutrients that are vital to growing a full, healthy beard. Not only do we offer oils for growth, strength, protection and repair, we also offer an extra strength growth formula that utilizes the powers of tamanu oil. When it comes to growing a nice, healthy beard, it’s extremely important that you keep your growing beard moisturized and nourished or else your beard will become too dry and you’ll inevitably suffer from a sore, painful feeling under your beard. Growing out your beard is a very rewarding experience. There’s a lot of ups and downs...highs and lows. It’s something that you can put years into. It’s understandable to be protective of your beard when you notice an issue, or even when you think you notice an issue. What commonly happens is that you start noticing that your beard may not be growing as much as it should be. It’s possible that it stopped growing. But don’t worry. It is not unusual to experience periods of time in which your beard has either slowed in growth or stopped altogether. Luckily for anyone with a beard, this is not permanent. There are even ways to get it growing again no problem. And it doesn’t involve any magic spells either. We also examined three common reasons why you may be experiencing a sudden change in growth. A common reason why your beard may not appear to be growing is breakage. Hair that's dry, over processed, and brittle will break off and appear to never grow past a certain point. We will mention it a few times but that’s how important it is to realize. Over-shampooing (even regular frequency of shampooing with most shampoos) can lead to dryness and breakage. Wavy and curly hair are particularly affected. To prevent this from happening, be sure to use a gentle, hydrating beard shampoo and conditioner a few times a week. It is important to note that shampooing too often will strip the hair of its natural oils, leaving it even drier and prone to breakage than it was before. Luckily our beard shampoo is more gentle and cleanses your beard and skin without stripping too many natural oils. After shampooing and conditioning, be sure to apply a natural beard oil so that your beard does not dry out. Replenishing your hair with healthy essential oils will keep it nourished and less prone to breakage. Another great solution is our Beard Grooming Kit with Repair Formula which contains our formulated beard oil and beard balm to cure breakage and dry skin causing breakage along with our shampoo and conditioner. Split ends occur when hair when a single strand of hair splits into two at the end. In severe cases, the strand may split into multiple ends. They are mostly caused by brushing or combing too harshly, over shampooing, and blow drying. One big problem that we have noticed is that many combs have cracks and microscopic chips that cut through dry hair like a saw. Many cheap plastic combs splinter and break easily which is bad news for beards as they are made with injection mold plastic. Metal combs can have the exact same problem. Burrs are painful and they can show up on almost anything made out of metal. Plus the scraping of metal teeth on my cheeks does not feel good. Call me crazy. Wooden combs....talk about splinters. It’s true you can find a well-made wooden comb but there has never been one that does not soak up excess beard oil. Some use this as a selling point for the comb. But the big problem is that a lot of the oil that ends up in wooden combs is not just beard oil. It’s your natural oils as well. This is no good because your body oil is dirty and honestly, a little gross. It’s okay, though. It’s like this for everyone. Thinking that the soaked in beard oil will condition your beard as you comb it? Not really because it’s filthy. Also beard oil expires over time. It can take anywhere from 6 months to 2 years but it will go bad eventually taking your beautiful wooden comb with it. We recommend Kent beard combs as they are made with a crazy high quality plastic that is hand-sawed for each comb. It’s perfectly formed and smooth. It’s quite literally made for your face. And they’re unbreakable. Our favorite is the folding comb with pocket clip. It won’t snag your hair or damage the ends whatsoever. It’s also big enough for most beards as well. A balanced diet is essential to growing a long, healthy beard. Growing healthy hair is pretty similar to growing a healthy body. The good news is you can leave the dumbbells where they are. Nutrition for hair growth is very important and the same goes for beards. You need to make sure that you get the proper vitamins and plenty of protein and omega fatty acids. Specifically you need iron, vitamin E, trace minerals such as selenium, copper and even magnesium to keep your beard in great shape. A diet high in lean protein such as fish and plenty of fruits and veggies will make sure to feed your mane what it needs to keep growing properly. Drinking enough water is also very important. If you’re looking for specific foods to get your beard growing then have a look at our video here. You may be noticing that your beard isn’t growing as much as it used to be or even at all. But you have to know that it’s okay and normal for it to happen. We gave you some common issues and solutions for these issues that can impede growth that should be very helpful. Here are some recommendations to boost your growth naturally that will help with many common issues but also is formulated to stimulate hair follicles and promotes blood circulation. The two beard-related questions I'm asked the most are 1) how do you grow a beard? and 2) what are the best growth products to use when growing a beard? While human hair grows an average of half an inch per month, there are things you can do to encourage beard growth and prevent conditions that slow down your growth such as breakage, beard split ends, beard dandruff, and ingrown facial hairs. To successfully grow a long beard, it's important to consume the right vitamins and nutrients that your body needs in order to 1) grow at a normal, healthy rate and 2) prevent the whiskers that you've already grown from breaking. Shampoo your beard with a gentle beard shampoo with tea tree oil. Why tea tree oil? It’s a natural disinfectant that exfoliates and removes dead skin and build-up, preventing beard dandruff, acne, and ingrown facial hairs. Use a hydrating beard conditioner after shampooing your beard. After using beard shampoo, apply some beard conditioner and rinse. The beard conditioner will soften your beard and make it less likely to break unlike just using beard shampoo. And since you want to grow a beard faster, it’s critical that your facial hairs be soft and healthy so they don’t break and cause beard split ends. Moisturize your beard with an all-natural beard oil. Using high quality beard oils is essential to healthy beard growth. Why? Because a dry, brittle beard is prone to breakage. Just like the hair on your head, split ends in your beard cause the cuticle to fray, essentially damaging and cutting off the hair that you've worked so hard to grow. Beard and Company's Extra Strength Beard Growth Oil is the best blend of essential oils formulated to encourage beard growth plus tamanu oil, a Polynesian oil derived from the seeds of the tamanu tree. It's packed with all the antioxidants, omega-3 fatty acids, proteins, and vitamins you need to grow a healthy beard. Following these 3 simple steps every day will encourage your beard to grow faster by keeping it clean, exfoliated, moisturized, enhanced with vitamins and nutrients, and free of problems that cause beard breakage. If you've ever wondered, "How can I grow a beard? Or how do I grow a beard and keep it looking nice while it's still growing?" Here's what you SHOULDN'T do if you're looking for the best way to grow a beard. The biggest reason men should trim their beards during the growth process is because not all hair grows at the same rate. Everybody, including myself, experiences uneven beard growth at some point and it's highly recommended that you take care of it early on in the growth process. Otherwise, it may be harder to fix in the future. Also, beards have become very trendy and many of the best beard styles require regular trimming. Like regular hair, beards should be shampooed in order to remove oil, sweat, and product build-up. It is important not to overdo it, though, or you may strip the hair of its natural oils. 3-5 washes per week with a high quality beard shampoo is ideal. It is also important that you do not air dry because the hair will be drawing out moisture from your skin, which will dry it out and made it flaky. Applying beard oil to your beard after your shower is the best way to seal in the moisture. This goes along with not trimming. Most beards should be shaped at least a little because even if you want to have an all-natural looking beard, it most likely look and feel better with a good shape. Consider your hairstyle. Wouldn't it look pretty boring if it was all one length? The same logic applies to your beard. While we're not saying that you should run out and get the trendiest hairstyle that's out there, a good complimentary style will only enhance the awesomeness of your beard. While we all want to have the thickest, longest beard as quickly as possible, it's important to remember that everyone is different and that every beard grows at different rates. It could take you a month to grow the same length your friend grew in a week. And that's okay. What's important is how well you keep your beard maintained at every stage of growth. Age is also a factor. If you're wondering how to grow a beard at 18 or 17, it may be difficult for you at this age. Start caring for your skin and face now and you will set yourself up for a great beard later. Many men in their early 20's may find it difficult to get much growth at all but will usually have little trouble growing a full beard later when they're in their 30's. When it comes to growing a beard, quality is definitely better than quantity. By keeping your beard trimmed, clean, and healthy, it will look great no matter where you are in the growth process. In order to make your beard grow, you need the right nutrients. Keep reading to learn how to grow beards with the right diet. If you're growing a beard, there is a good chance that you have struggled with growth, especially during the early stages. Either your beard grows too slowly or not at all. When this happens, you may be tempted to buy vitamins like Beardilizer, Beard Grow XL, VitaBeard, or others found at gnc or Wal-Mart that promise to boost your beard growth. But do these vitamins do what they claim? Will they actually make your beard grow faster? “There are no specific vitamins that grow hair,” Dr. Zoe Diana Draelos, a consulting professor of dermatology at the Duke University School of Medicine told The New York Times. "While vitamin deficiencies, notably iron and vitamin D, can contribute to hair shedding, there just isn't data to support the efficacy of vitamin supplements, like biotin or Hairfinity," dermatologist Marie Leger, who practices dermatology at NYU Langone Medical Center. Approximately 80 to 90 percent of her patients have tried biotin supplements in a failed attempt to restore hair loss before stepping into her office. One of the problems with hair growth multivitamins is that there is no regulatory definition for what a multivitamin is, so a vitamin from one company can be completely different from another company’s version. Rather than spending money on multivitamins and supplements, your best bet is to eat foods that are rich in the vitamins and nutrients that your body needs to encourage beard growth. That way, you get 100% of the vitamins and minerals you need along with much needed fiber and protein. Contains anti-fungal, anti-viral and antioxidant properties that improve circulation to follicles. Unshelled pumpkin seeds are high in zinc, a vitamin that is vital to the process of building cells. Hair loss is often caused by a zinc deficiency. It’s packed with vitamin A, iron, beta carotene, folate, and vitamin C. These vitamins work together to keep your follicles moisturized. They are high in vitamin C which strengthens and protects your beard from breakage. They also contain over 30 different cancer-fighting carotenoids. Our bodies convert beta carotene into vitamin A which encourages your skin to product a natural oil that moisturizes and protects your beard. Having dry and dull hair is a sign of a deficiency in beta carotene. Orange colored fruits and vegetables like sweet potatoes are excellent sources of beta carotene. If your diet does not contain enough protein, it can stop growing and older hair will eventually fall out. Rather than choosing sources of protein like pork and beef, try leaner sources of protein with less saturated fat. They are rich in biotin which encourages hair growth. 36.5 grams (or ¼ cup) of raw peanuts contain 88% of your recommended value of biotin. Boasting high levels of magnesium, potassium, and B vitamins, tuna is an excellent source of protein that will keep your beard and body healthy. These guys are loaded with vitamin B12 which helps create red blood cells that carry oxygen to hair follicles in your beard. It’s packed with vital omega 3 fatty acids that our bodies are unable to produce for themselves. They protect you from diseases and keep your hair healthy, shiny and strong. How do you grow a beard? Maybe you're trying to grow a beard for the first time or you already have a beard and want to increase your beard growth. But you've heard the same advice a million times: if you want to grow a beard, just don't shave. Listen: Just not shaving your beard is fine if you're going for a Tom Hanks in Castaway look, but if you want to look polished and professional, you'll need to use the right grooming techniques and beard products to take proper care of your beard. To help, we put together the biggest list of proven beard growth tips ever. Then we added a few more. Don't use regular hair products like shampoo or soap on your beard. They are far too harsh to use on delicate facial hair and skin. It's critical to use products made specifically for beards. There are approximately 100,000 hairs on your head vs 30,000 hairs on the average man's face. The skin under your beard is far more delicate than your scalp. Using regular soap or shampoo in your beard is a fast way to strip it of its natural oils. Use all-natural beard products formulated to repair split beard ends and encourage growth. What are the right ingredients for beard growth? Castor oi, almond oil, jojoba oil, thyme, geranium, and tea tree oil are among the best oils for increasing growth. Authentic essential oils are pricey. So if you find a dirt cheap beard oil that seems too good to be true, it probably is. Stay away from any beard product with vague ingredients like "fragrance oils" or "naturally derived fragrance"
Wash your beard with a beard shampoo 3-5 times per week to keep your beard clean of dirt and debris. If you over-wash your beard or use a harsh shampoo or soap, you will strip your beard of its natural oils which leads to beard dandruff and beard split ends. Speaking of beard shampoo, be sure your beard shampoo contains tea tree oil. Tea tree cleanses your scalp and cures beard dandruff. It's important to exfoliate the skin under your beard to prevent oil build-up and dandruff. Dip a medium-bristle toothbrush into your favorite beard shampoo, like Beard and Company's Beard Shampoo. While showering, wet your face and beard with warm water. Work the bristles of the toothbrush all around and beneath your beard to scrub away dead skin. After washing your beard with a good beard shampoo, follow up with a hydrating beard conditioner. Leave it in for the duration of your shower and rinse right before your shower is over. Use a beard oil every day after showering to keep your beard from becoming too dry and brittle. Use a beard balm to keep your beard styled throughout the day and to train the new hair to grow in the direction you want it to grow. When it comes to ingrown beard hairs, it's best to pluck them out. Keeping your beard conditioned with a high quality beard oil is the best way to prevent ingrown hairs in your beard. Ignore your initial beard itch. Around week one, your beard will start to come in and will probably be very itchy. This is because the beard hair is new and is causing your face to feel very dry. Use an all-natural beard oil free of alcohol (alcohol will dry out your skin even further) to soften your new beard and stop the itch. Once the first 4 weeks are over, get regular trims when necessary. An electric beard trimmer is great for cutting back the edges of your beard, but when it comes to shaping the majority of your beard, use a beard comb and scissors to avoid accidentally trimming too much. Use a high quality comb for your beard. Saw cut beard combs are the best because unlike wooden boar's head brushes, they won't soak up all of your beard oil and leave your beard dry. Instead, the saw cut comb is designed with flat teeth so it won't bind or pull hair, plus the glossy finish causes the comb to glide smoothly through your beard without snagging. Wash your beard with cool or lukewarm water. Hot water will dry out your skin. Use a beard growth oil with castor oil to speed up the growth process. Want to stop accidentally over-trimming your beard? Use a nose hair trimmer instead of a beard trimmer since it can only trim a few hairs at a time. When it comes to having a patchy beard, the best thing you can do is trim around your jawline and cheeks with an adjustable length beard trimmer to give make the patchiness less noticeable. It's normal to have trouble connecting your mustache to your beard when you're early in the growth process. The best way to deal with a mustache that doesn't connect to your beard? Use an all-natural mustache wax to train your mustache to grow into your beard. The most important thing you can do to increase beard growth is eat a healthy diet full of vitamin-rich foods. Skip the junk food and eat plenty of fruits, veggies, and clean sources of protein like beans, nuts, and oily fish. Bottom line: If you're not eating the right vitamins and nutrients, you won't have the right fuel to grow a long and healthy beard. Drinking lots of water not only keeps your cells, tissues, and organs functioning properly, but it also flushes out toxins, which makes a huge difference with beard growth. But how much water do you really need to drink in a day? According to Robert Weiss, MD, chief of pediatric nephrology at Maria Fareri Children’s Hospital of the Westchester Medical Center in New York, "In general, you should try to drink between half an ounce and an ounce of water for each pound you weigh, every day." Massage your beard and face to increase blood flow. This will also help with the stress reduction part (see #7). Get plenty of sleep and learn how to manage stress. When it comes down to it, the biggest decider of your beard growing abilities is your genetics. Age is definitely a consideration if you have trouble growing a beard. If you're under 20 and unable to grow a beard, the best thing you can do is eat a healthy diet and stay active. Growing a great beard takes time. It's best to take a quality over quantity approach so your beard will be thicker, longer, and truly awesome. Stimulating beard growth and having a healthy beard is definitely possible with the right diet, grooming habits, and beard care products. With a little effort, you can grow the beard you've always wanted. Keep your beard moisturized by using a cleansing beard shampoo, hydrate with beard oil, and style with an all-natural beard balm free of synthetic sealants like petroleum jelly. Stripping away your natural oils will not only dry you out faster, it will make your hair brittle and very unhealthy. This is how hair breaks so easily. You may be noticing that your beard isn't growing anymore. It is growing in reality but the ends are brittle and are being snapped or broken off. Stay healthy by eating a balanced diet rich in fruits and veggies, drink plenty of water, and exercise. Protein and omega fatty acids are some of the best nutrients you can put in your body for many reasons and hair growth is one of them. A healthy body grows healthy hair. Even finger and toenails are affected by diet, nearly everything in your body is. You'll even find your mind sharper if you eat a proper breakfast. This helps kickstart your body to do what it needs to do. You can't run a marathon without a proper warm-up. Same goes for beard and hair growth. Castor oil is one of the most popular carrier oils for hair growth and it’s been that way for good reasons. Many generations of women all around the world use castor oil as a hair growth remedy. It’s no wonder that it’s an ingredient in women’s hair care products and other similar hair growth products but have you ever stopped to wonder why that is? Whether or not you have, you should get the details on castor oil here. First let’s learn a little about it. Castor oil is made from the seed of the Castor plant (Ricinus Communis) commonly found in India. Its anti-allergenic properties have made it a popular at-home remedy for everything from skin rashes to hair thinning. It’s also high in ricinoleic acid which is an omega-9 unsaturated fatty acid. This is the good stuff that restores moisture, shine and health due to its nourishing power and why it is so popular. Just check out this list of properties: anti-bacterial, anti-inflammatory, stimulates hair follicles, promotes blood circulation, adds shine, provides necessary proteins and omegas for hair growth. It’s no wonder why castor oil has been a popular hair growth treatment for a while. That’s why castor oil is a major ingredient in many of our growth products along with jojoba oil, almond oil, argan oil among others. Castor oil is one of the best carrier oils for beard growth out there. It’s moderately priced, very effective, goes on light and does not feel heavy, absorbs quickly into skin and hair. It coats strands of hair and keeps them from breaking off. There is a wide range of quality when it comes to castor oil, or any carrier oil for that matter. It’s important to find cold pressed oil which is what we use. Cold pressed means no heat is used in the extraction process, it is simply pressure that’s applied. What this means is that no nutrients or anything of substance that’s worth using it for is damaged in the process. Luckily no matter the hair type you have, castor oil is perfect for you. Dry hair, coarse beard...it’s all the same for castor oil. Since it’s nourishing and light, it gently coats the hair cuticle trapping in moisture. This makes castor oil ideal for any hair type since it’s main job is hydration. If your hair or scalp is generally oily it may be possible that it’s due to an imbalance. Using natural oils like castor oil in proper proportions and under the right conditions your hair will become easier to manage and will grow better and faster as your body intended. After all a healthy scalp grows healthy hair. This includes using a natural cleansing beard shampoo that will not strip away your own oils. Build-up of harsh shampoos, hair products, dirt and grime can and do inhibit healthy hair growth. It’s a good idea to wash out hair products no longer than 24 hours after applying them leaving a clean scalp and hair. If you've ever Googled how to increase beard growth naturally, it's likely you've heard about castor oil and claims that it encourages beard growth. Though using castor oil alone isn't the best option for beard growth, it turns out you can boost your beard health and even increase its growth with the right blend of castor oil and essential oils. The trick is finding just the right combination. In this post, we're going to explain why castor oil alone will not grow your beard and what essential oils are best for growing long, healthy beards. Castor oil is made from the seed of the Castor plant (Ricinus Communis). Its anti-allergenic properties have made it a popular folk remedy for everything from skin rashes to hair thinning. Many oils we use are antifungal and antibacterial which are well-known enemies of healthy hair. Luckily using a combination of these oils for facial growth products work wonders to stop issues from even happening. Argan oil fights hair loss and helps thinning hair grow fuller. It is known by a few different names such as "tree blessed by Gods" in Morocco. It's also known as "liquid gold" and for darn good reasons. Contains a large amount of antioxidants and vitamin E which revitalize cells of your hair. Has a high amount of linoleic acid to restore shine and health back into your follicles. Nourishes keratin to normal levels. Encourages cell regeneration for already-damaged hair. Almond oil cleanses the scalp and treats beard dandruff. It packs an incredible amount of vitamins, nutrients, and protein into each serving. It's no surprise then, to learn about its awesome healing properties and why almond oil is great for increasing beard growth. Almonds contain high levels of magnesium and biotin, both of which are vital nutrients for beard growth. When it comes to beard growth, dandruff is your enemy. Luckily, almond oil cleanses the scalp and removes dead skin cells which destroys dandruff. Learn more: how to treat beard dandruff. The high fatty acid content of almond oil moisturizes and softens skin which improves circulation and in turn, increases beard growth. Jojoba oil keeps beards moisturized and hydrated. It is the liquid that's produced from the seeds of the Jojoba plant (Simmondsia chinensis). Unlike other oils, jojoba doesn't make your skin feel greasy or leave residue behind. A buildup of sebum can drastically slow down the growth of your beard. Since jojoba is non-allergenic, it gently removes excess sebum, leaving skin clear and hydrated. Jojoba has a low melting point, so it absorbs quickly into your beard and is fast acting. This is especially useful for treating beard split ends. For the best results in beard growth, you should use a beard growth oil with a combination of healthy carrier oils like almond oil, argan and jojoba oil paired with the right proportions of complimentary essential oils for increasing beard growth. Using a carrier oil alone, such as castor oil, won't do much for your overall beard health and beard growth. It is a great oil to use in combination with other oils, though. It's a great oil but really requires some assistance to bring out its full potential. We combined castor and tamanu oil with our natural growth formula for an oil fitting of the name "extra strength." When we talk about the right combination, we mean it and this is the result. High quality tamanu oil like what we use has been used around the world to facilitate hair growth. It fights bacteria that can retard hair growth. There are many factors that lead to hair not growing properly and with this oil you can combat many of them. Have you heard some buzz about jojoba and its use as a beard oil? Are you wondering whether it's the real deal or just another fad? Jojoba oil is actually a type of wax that's derived from the Jojoba plant. It's been used for centuries to treat skin and hair ailments, but only recently have we begun to understand why it works. The nutrients found in jojoba can balance the body's natural oils, leading to improved skin and hair. There's even some evidence that it can prevent hair loss when used regularly. So do the real-life effects of jojoba live up to the hype? And if so, how helpful are its properties in beard care and maintenance? Well, let's look a little closer at this 'miracle' plant. Jojoba is an ideal skin moisturizer. Unlike many traditional oils, it won't leave a residue behind or make your skin greasy. It's gentle and non-allergenic, which is why jojoba beads are often used in natural exfoliating scrubs designed for sensitive skin. Jojoba melts at a low temperature, meaning it will absorb quickly, keeping your skin hydrated and pores clear. But it isn't just good for skin. Because of a special property that causes jojoba wax to remove excess sebum, it can do wonders for oily or dry hair. Sebum is a natural oil your body produces to stay hydrated which, when overproduced, leads to oily hair and build-up. Sebum is a double-edged sword, because if your skin or hair is dry, the hair follicles produce more sebum, often leading to pore blockages and oily skin. Jojoba can bring this natural process back into balance, and regular use can prevent future problems. Know what else the removal of excess sebum encourages? Hair growth. Sebum buildup can inhibit the hair's full growth potential, so using jojoba regularly can actually encourage beard growth. It's great to know that jojoba can keep your skin hydrated, oil-free, and promote hair growth. But you're probably wondering if it's the infallible repair oil you've been hearing about. Well the good news is, yes. It is. It helps hair grow, but it also helps damaged hair heal and stay healthy. Hair becomes brittle or breaks when it isn't fully hydrated. Because jojoba keeps hair safely hydrated, it keeps it strong and healthy too. And did I mention it's packed full of nutrients that support healthy hair? If your body is lacking in Vitamin E (one of the most essential vitamins for hair and skin health), jojoba has you covered. Vitamin E is very effective when applied topically, so you can put it directly on the source of your beard frustrations (goodbye dietary supplements). Vitamin B is also present, and aids in retaining moisture, improving your hair's ability to stay hydrated. Is jojoba oil good for growth? Jojoba oil isn't a new fad. It has been used to cure hair and skin woes for generations. Thanks to modern science, however, we now have proof of what our grandparents always believed: Jojoba oil can keep hair healthy, repair damage, and give your beard the nutrient boost it needs. At the end of the day, it may be a bit of a stretch to call it a miracle, but you have to admit it's pretty close. Growing a beard can be difficult for many reasons. Dry skin under your beard, beard itch, dandruff, and ingrown hairs are some of the most common issues we see that slow down many men's facial hair growth. Here at Beard and Company, we are obsessed with finding the best all-natural ingredients to use in our beard and hair products. Our research has led us to a vitamin-packed oil that naturally treats dandruff, inflammation, and most issues that keep men from growing healthy beards: tamanu. Tamanu oil comes from the nut of the tamanu tree which is native to the South Pacific. The nut is cold pressed into a dark green oil that is used as a natural antibiotic due to the presence of calophyllic acid. This special type of fatty acid helps to regenerate skin and even aid in healing scars, sunburns, and wounds. It also carries anti-inflammatory and antibacterial properties which is perfect for issues like acne, painful skin under your beard, beard dandruff and patchy cheek growth. Tamanu oil restores shine and seals in moisture making it the perfect addition to your skin and hair care routine. Prevention of these irritating issues is the key to growing your beard even longer. Healthy facial hair is undoubtedly the best tool to continue beard growth. What is the best product for beard growth? 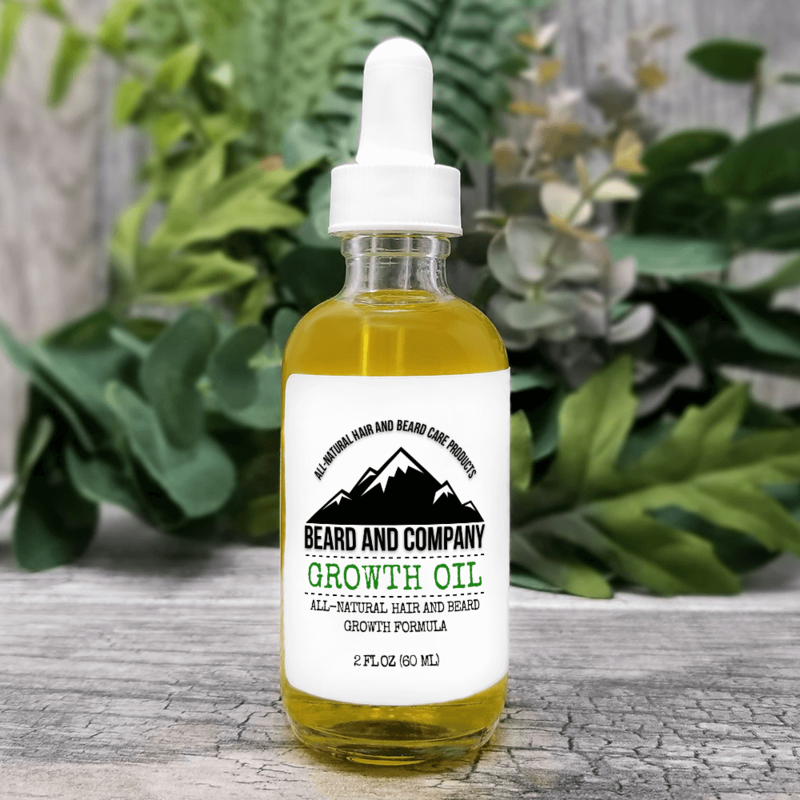 Beard and Company's Extra Strength Beard Growth Oil is formulated with the best all-natural essential oils and carrier oils that keep your beard healthy and make it grow faster. Use it daily after washing your beard with beard shampoo and conditioner to keep it moisturized. Utilizing the almost-superhero-like strength of tamanu oil is perfect when we combine it with our growth formula. Like beard oil, beard balm is essential to your daily beard care routine. Beard and Company's Extra Strength Beard Growth Balm contains the same great formula as our Extra Strength Beard Growth Oil, but in beard balm form so you can style your beard and keep it looking great all day while encouraging growth. Incorporating tamanu oil into your routine is very easy. Using our extra strength growth oil is your best bet to get that beard healthy and strong. Tamanu oil is a great hydrating oil to start with in the morning or night after a shower. You won’t find this hydration, health and protection in any other beard growth product except our extra strength growth oil. However you use it, you’ll feel the difference and will love it. The average person grows about 6 inches of hair a year. That comes out to ½ inch every month, or about 1.25 centimeters. Facial and beard hair is no different than regular hair as far as growth rates are concerned. Facial hair grows at the rate of 6 inches a year or ½ inch every month just like head hair. The problem that comes with growing facial is if your hair is not healthy then it will not grow as fast as it can. Issues like dryness, patchy spots, poor diet or the wrong products can lead to growth problems. Blood circulation is key in hair growth and it can’t grow without it. Shampoo alone does not make your beard grow. But there is slight truth to this. Massaging your skin and hair follicles stimulates them and increases blood circulation which is a key factor in hair growth. Another factor to look out for is making sure the shampoo you use does not strip away your natural oils. Shampoos usually contain surfactants which are known to dry out hair and skin. Finding the right beard shampoo for you will not only condition your facial hair properly but it will keep it from drying out leading to breakage. Using Beard and Company's gentle beard shampoo and conditioner. The more dry your beard hair feels, the more likely it is to break off, and dry skin does not grow hair as quickly as it can. In order to have properly growing facial hair you need to have your skin properly conditioned. When your skin is dry and your facial hair doesn’t have the proper nutrients the hair follicles can curl back into your pores causing irritation and pain. When these hair follicles grow back into your pores they can cause ingrown hairs if they continue to grow underneath the skin. Flaky skin is a major problem as well. Harsh face washes and shampoos do too good of a job stripping oils they end up taking away your natural oils that your skin desperately needs. Having patchy spots in facial hair is quite common but there are ways to fill them in. Keeping your facial hair and skin underneath properly conditioned with gentle washes and beard oils will soften the area allowing your hair to grow properly. Using products with shea butter works very well as it coats follicles providing moisture and volume. It will help not only make your beard and facial hair appear fuller but it will protect it from damage and dryness. Certain beard oils contain ingredients such as tamanu, rosemary and thyme oils which have been used for years to stimulate hair follicles and promote blood circulation which in turn leads to faster hair growth. Concentrating on these patchy areas at beard’s inception is key to thicker and fuller facial hair. It’s about time that this question gets addressed properly once and for all. Who hasn’t heard this before? I remember hearing it around the beginning of high school when sideburns and thin mustaches start to sprout on awkward pubescent faces. This is where a lot of misinformation and myths start. Kids when they don’t know any better can create crazy rumors. Will shaving help me grow a beard? The short answer is that no, shaving will not make your hair grow any faster, better or even thicker. There is no evidence to suggest this is close to true. The myth really perpetuated for a few simple reasons which we will talk about here. -You start shaving more and more. As time goes on you may see a correlation of your facial hair coming in better over time. This is purely an over-time deal and the shaving itself has no scientific evidence to prove otherwise. If this were the case, then there wouldn't be any bald men. -Shaving with a razor exfoliates your skin and allows your beard to be cut very evenly. This has an appearance of a thicker 5 o’clock shadow making it seem like it’s growing intensely. -Men who have trouble growing their beard usually try a few different methods of hair growth inducing. Proper diet and exercise can make a huge difference. Omega 3 fatty acids, protein, plenty of water, vitamins...all this is important for body health along with hair health as well. And beard hair is no exception. -There was a Seinfeld episode where Jerry shaves his chest and it comes back thicker. It’s of course not true but makes for a very funny episode. Are you looking to grow a yeard? It takes about 1 whole year to grow your beard about 5 inches naturally. Think about that for a minute. That means if you’re looking to grow your main mane fully, you need every bit of help you can get. There is a lot of nasty stuff that can prevent your beard from growing. Dry itchy skin under your beard, the infamous beard dandruff, painful skin underneath your beard. Luckily we have a lot of options to help you with these here. The most common solution is beard oil and beard balm. They contain oils and butters like almond oil, jojoba oil, shea butter and many other similar types of conditioning ingredients. Beard oil and balm soothe the skin and hydrate your facial hair and skin. This can treat many issues like dry skin, dandruff and brittle or damaged hair. Beard and Company's all-natural beard oil and beard balm with beard protection formula protects your beard from dry skin and inflammation. Commonly known as Rogaine, minoxidil is commonly used to regrow thinning hair in men and women. It's important to consider that Rogaine is used to treat hair on your head that is already thin and balding. If you are unable to grow a beard, however, it is usually due to genetics and not baldness. While some men have been able to increase their beard growth in patchy areas using Rogaine for facial hair growth at 5%, others have had mixed results. It often takes more than a year to see any results. Though minoxidil is FDA approved to regrow thinning hair on your head, it has not been approved for beard or facial use. If you are interested in purchasing this product, Kirland Minoxidil is a popular choice. It depends on the ingredients in the vitamins and whether or not you're already getting those vitamins in your diet or in your regular daily multivitamin. The ingredients found in beard growth vitamins like biotin, MSM, silica, pantothenic acid, hyaluronic acid, and vitamins A, C, D, E, and B6 can commonly be found in multivitamins that cost far less than vitamins that promise to grow beards. Many of these vitamins also contain gluten, malt syrup, and sugar as fillers. The best things you can do to boost your beard growth are to eat a healthy diet full of fruits, vegetables, leafy greens, and protein; and by grooming your beard properly. Grooming your beard properly involves using a gentle beard shampoo instead of regular shampoo, soap, or body wash and keeping it moisturized with beard oil or other products that hydrate facial hair. If you keep your beard moisturized and have a healthy diet, it will grow long and full without using expensive beard growth vitamins. Now that you've learned how to grow a beard, we hope that you are able to find the best facial hair growth products and tips that will help you grow a longer, fuller beard. How Can I Make My Curly Beard Straight? Can I Use Body Wash in My Beard Instead of Beard Shampoo? What's Better for Dry Beards, Beard Oil or Coconut Oil? Learn the solution of the Rubiks Cube and measure your solution times with the online timer.